During the 1670s, the Dutch microscopist Antonie van Leeuwenhoek was the first to see a world previously unknown, which included the fibers of a muscle, bacteria, sperm cells, and the nucleus in the red blood cell of salmon. The next reported sighting of a cell nucleus was in 1802 by Franz Bauer, an Austrian microscopist and botanical artist. However, credit for its discovery is generally assigned to the Scottish botanist Robert Brown. When studying the epidermis (outer layer) of an orchid, he saw an opaque spot that was also present during an early stage of pollen formation; he called this spot a nucleus. Brown first described its appearance to his colleagues at a meeting of the Linnean Society of London in 1831 and published his findings two years later. Both Brown and Bauer thought that the nucleus was a cell structure that was unique to monocots, a plant group that includes orchids. In 1838, the German botanist Matthias Schleiden, the co-discoverer of the cell theory, first recognized the connection between the nucleus and cell division, and in 1877, Oscar Hertwig demonstrated its role in fertilization of the egg. CARRIER OF GENETIC MATERIAL. The nucleus, the largest organelle within the cell, contains chromosomes and deoxyribonucleic acid (DNA), and regulates cell metabolism, cell division, gene expression, and protein synthesis. The nuclear envelope—a double membrane surrounding the nucleus and separating it from the rest of the cell—is in continuity with the rough endoplasmic reticulum, the site of protein synthesis. At the time of his 1831 discovery, Brown was an established botanist. Earlier in his career, from 1801–1805, he collected 3,400 species of plants while in Australia and described and published reports of 1,200 of these. In 1827, he reported on microscopic pollen grains (and later other particles) moving continuously and randomly through a liquid or gas medium colliding with one another. An explanation of this Brownian motion came in 1905, when Albert Einstein explained that it resulted from molecules of water that were not visible hitting visible pollen grain molecules. SEE ALSO: Metabolism (1614), Blood Cells (1658), Leeuwenhoek’s Microscopic World (1674), Spermatozoa (1677), Cell Theory (1838), Deoxyribonucleic Acid (DNA) (1869), Genes on Chromosomes (1910), DNA as Carrier of Genetic Information (1944), Ribosomes (1955), Cell Cycle Checkpoints (1970). 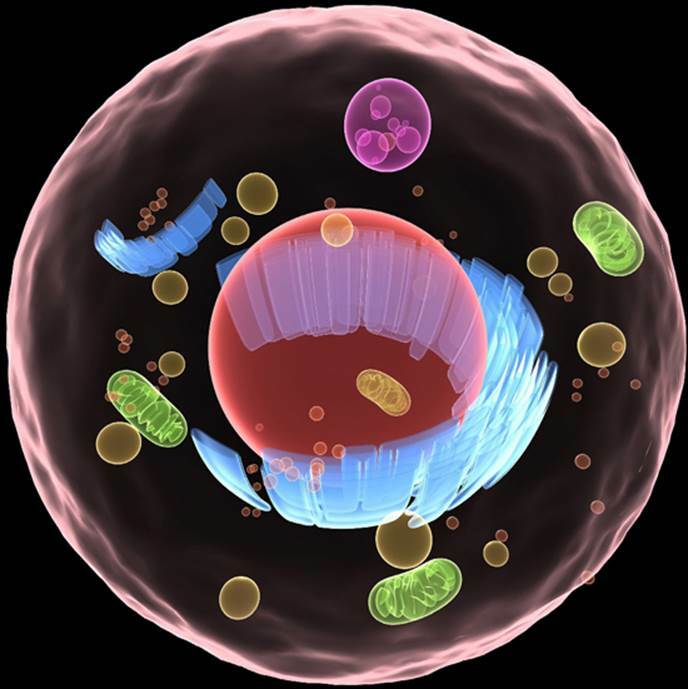 Interior three-dimensional image of an animal cell, with the nucleus as the large, round organelle in the center.